My mom’s birthday came around again, which meant it was time to go eat sushi! 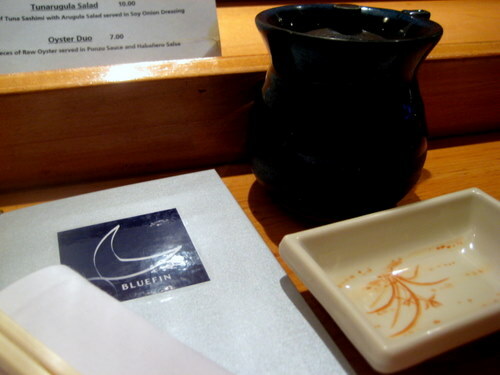 We stuck with the burbs, but since neither of us had ever been, we went to Bluefin in Plymouth Meeting. And even on a tuesday night, and after making reservations in advance, we still could only get a seat at the sushi bar. It’s kind of crazy how busy this place is. It’s so unassuming on the outside, being in a random sad little strip mall. But it’s quite nice on the inside. We indeed sat at the sushi bar and all the sushi dudes were busy, busy, busy the entire time we were there. I always like to get a salad to check out what the dressing is like. It was good! 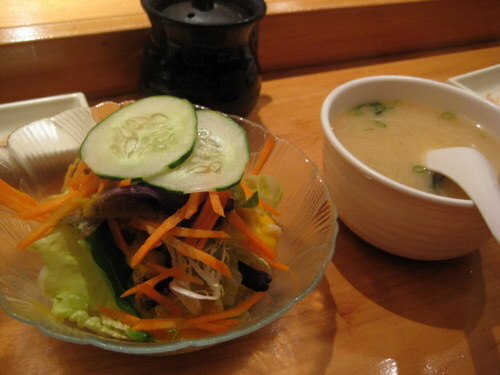 I also thought the miso soup was quite good, but my mom thought it was a little bit too salty. I think she’s slowly going senile, it was perfectly good soup. 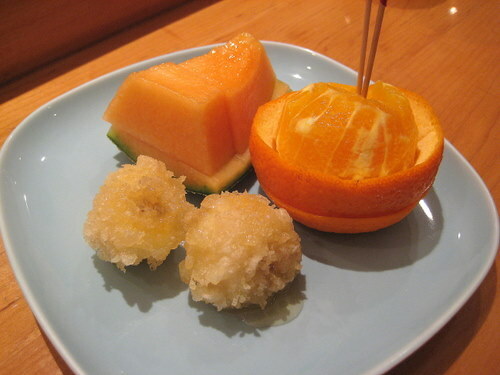 The server guy, or owner guy, or manager guy, recommended the Usuzukuri as an appetizer. 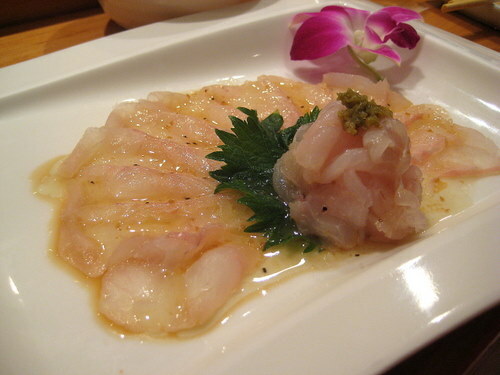 It is extremely thinly sliced fluke served in a yuzu dressing with jalapeño paste. This was delicious but totally unecessary. The fish is super fresh (brought in daily except sundays) and it absolutely melts in your mouth. The jalapeno paste is also pretty darn spicy, but goes really well with the fish. I say it was unecessary because once we were done eating this thing, I was already getting fairly full, and we hadn’t even gotten our sushi yet. So it nearly rendered our entrees practically useless. This is typically why I’m not all that into appetizers, because I’m a fan of the main event. I really love agedashi tofu, so I wanted to try it here. Boy, was that ever a mistake. I am hoping this was just a major snafu. It was like they had some sauce concentrate, an they forgot to dilute it. It was mad, crazy salty and not in a good way. The tofu itself was great and so were all the fixins, but the sauce was terrible. Major fail! So my mom got the Sushi Dinner with 8 pieces of assorted sushi and a crunchy spicy tuna roll. Holy big pieces of fish, batman! Here’s something that blew our minds – how large these pieces of fish were. They do not skimp here! The ratio of fish to rice is about 4:1, no joke. 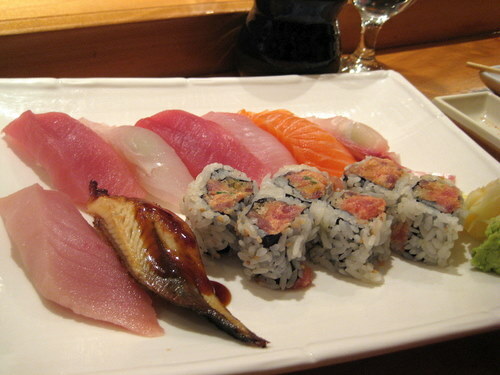 Like the fish in our appetizer, it’s all super fresh and they also do not skimp with the wasabi either. 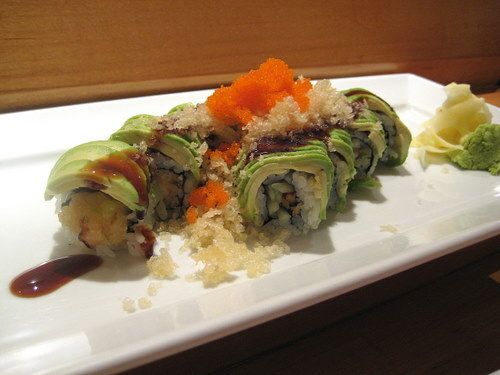 This is the Noname Roll I, with avocado topped on a shrimp tempura roll with unagi sauce, tempura chips, and roe. Oh man, this was good! The avocado was super ripe and buttery and melty and it’s also quite huge and filling. I don’t know if they even have proper dessert here, but you just get free dessert there. You get some fruit and some fried bananas. Not too shabby! Overall, the food was good and the sushi was fresh. 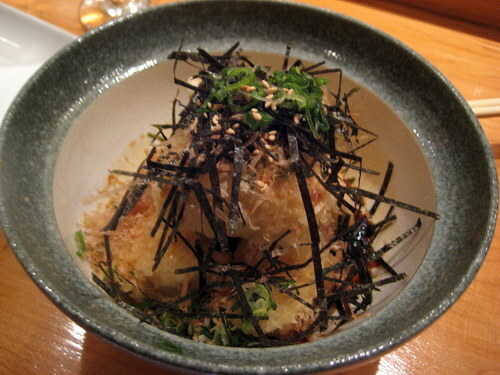 But it’s hard to overlook the major agedashi tofu fiasco. The service was good. Considering just how busy it was, the food came out at a decent pace. I’m not quite convinced that it’s worth all the hype, but it was a nice night out.